The golden age of adventure stories returns with this splendidly designed, action-packed, globe-trotting tale that combines the bravura storytelling of Kipling with the irresistible style of The Adventures of Tintin. Behind the staid public rooms of an old world gentlemen’s club operates a more mysterious organization: The Explorers Guild, a clandestine group of adventurers who bravely journey to those places in which light gives way to shadow and reason is usurped by myth. The secrets they seek are hidden in mountain ranges and lost in deserts, buried in the ocean floor and lodged deep in polar ice. The aim of The Explorers Guild: to discover the mysteries that lie beyond the boundaries of the known world. Set against the backdrop of World War I, with Western Civilization on the edge of calamity, the first installment in The Explorers Guild series, A Passage to Shambhala, concerns the Guild's quest to find the golden city of Buddhist myth. The search will take them from the Polar North to the Mongolian deserts, through the underground canals of Asia to deep inside the Himalayas, before the fabled city finally divulges its secrets and the globe-spanning journey plays out to its startling conclusion. The Explorers Guild is a rare publishing opportunity, powered by the creative passion of one of the world’s true storytelling masters, Kevin Costner. Kevin Costner is an internationally renowned filmmaker. Considered one of the most critically acclaimed and visionary storytellers of his generation, Costner has produced, directed, and/or starred in such memorable films as Dances with Wolves, JFK, The Bodyguard, Field of Dreams, Tin Cup, Bull Durham, Open Range, Hatfields & McCoys, and Black or White, among many others. He has been honored with two Academy Awards, three Golden Globe Awards, and an Emmy Award. Jon Baird is the author/illustrator of the novels Day Job and Songs from Nowhere Near the Heart. He is a co-developer, with Kevin Costner, of the Horizon miniseries. Rick Ross is an artist and filmmaker whose first widely recognized work in graphic fiction was illustrating the Image Comics series Urban Monsters. He was the lead artist for the graphic novelization of Spike TV’s 1000 Ways to Die, and he has also created artwork for numerous animated motion comics, including for the Cinemax television series Femme Fatales. He publishes the online graphic fiction anthology Agitainment Comics. "With its colorful cast, exotic locales, and intertwined fates, the book slowly addicts. A rousing throwback whose spinning plates never stop, even at the end." 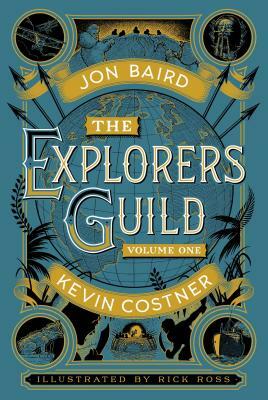 "The Explorers Guild is a rare publishing opportunity, powered by the creative passion of one of the world’s true storytelling masters, Kevin Costner."